During the cessations of breathing the body will increase its efforts to take in air. Abdominal contractions are exaggerated and increase until breathing resumes. The contractions squeeze the stomach and force acid up the esophagus. The efforts to breathe also increase a negative pressure in the esophagus which also pull up acid. Patients in the dental office can be easily screened for Obstructive sleep Apnea (OSA) at the initial oral exam. 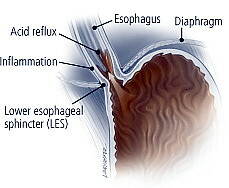 The signs of Acid Reflux (GERD) are screaming to be noticed: Acid tooth erosion is one consequence, bruxism is another. A sleep questionnaire and other signs and symptoms of sleep apnea will prompt the need for a HSS (home sleep study). This will help determine the diagnosis of OSA and the severity. By treating the sleep apnea we can save teeth and possibly the patient’s life. It’s so important to treat sleep apnea for many reasons. GERD is just one of them. One out of 3 people have a sleep disorder. Everyone knows someone with sleep apnea and has a story to tell about it. Don’t we, as dental professionals, have an obligation to help our patients live healthier and live longer? Every dentist should receive training to identify and treat their OSA affected patients. Thanks for finally talking about >HOW SLEEP APNEA INFLUENCES ACID REFLUX | My Blog <Loved it!